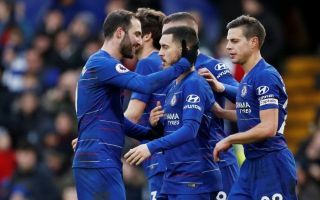 Real Madrid have reportedly got four Chelsea players on their transfer list for the summer – Eden Hazard, N’Golo Kante, Marcos Alonso and Callum Hudson-Odoi. Don Balon claims Madrid president Florentino Perez has a long list of targets all over the pitch ahead of what could be a major summer rebuilding job at the Bernabeu following the return of Zinedine Zidane as manager. While Real’s links with players like Hazard, Kante and Alonso are nothing new, this seems to be the first time Hudson-Odoi has come up on their radar. The 18-year-old has looked a huge talent whenever he’s played for Chelsea this season, though his limited opportunities under Maurizio Sarri has meant his future has been the subject of much speculation. It’s recently been claimed by the Sun that Bayern Munich plan to come back in for Hudson-Odoi this summer after a failed January transfer window swoop. The England youth international seems destined for a big career at the highest level of the game, but it may be that he’d do well to follow other English youngsters in moving abroad for more first-team football. Jadon Sancho, Reiss Nelson and Emile Smith Rowe are among recent examples of players who’ve gone down that route, and Hudson-Odoi at Real Madrid could now be the next big move by an Englishman abroad, according to Don Balon. It’s worth noting, however, that he’s listed as one of many similar targets, so it remains to be seen how much of a priority he’d be, but it’s certainly a worry for Chelsea to see four more of their players linked with Los Blancos, who raided them for Thibaut Courtois just last summer.